I was just joking about this last week in a story about the Sensium Wireless Monitoring Band-Aid. I suggested that you might use Geckel adhesive for a stickier bandage. MIT researchers have created an adhesive surface that works in wet environments (like inside the body). It is made from a biocompatible material (meaning that it does not cause inflammation) and is biodegradable - it dissolves inside the body when its work is done. The research team is led by MIT Institute Professor Robert Langer and Jeff Karp, an instructor of medicine at Brigham and Women's Hospital and Harvard Medical School. We are inspired by the gecko to create a patterned interface to enhance the surface area of contact and thus the overall strength of adhesion." Dry adhesives based on gecko-like nanotechnologies have been available since 2001; none meet the criteria for use inside the body. Karp then added a very thin layer of a sugar-based glue, to create a strong bond even to a wet surface. 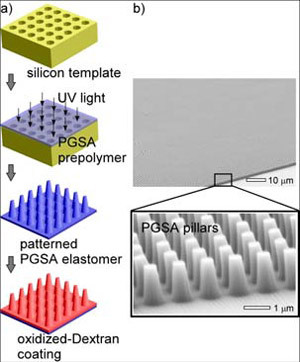 In tests, the nanopatterned adhesive bonds were twice as strong as unpatterned adhesives. In tests of the new adhesive in living rats, the glue-coated nanopatterned adhesive showed over a 100 percent increase in adhesive strength compared to the same material without the glue. Moreover, the rats showed only a mild inflammatory response to the adhesive, a minor reaction that does not need to be overcome for clinical use. From MIT creates gecko-inspired bandage via Gecko Tech for In Vivo Bandages.